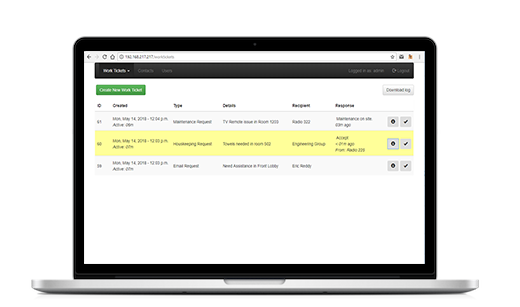 Teldio’s Work Ticketing System (WTS) is an all-in-one work ticket management system which can be set up in a matter of minutes, needing nothing more than an IP network connection and/or a radio network. Productivity is improved when users receive work tickets, accept jobs, and alert supervisors when tasks are completed. Teldio’s new Work Ticketing System (WTS) offers an all in one solution at a fraction of the cost of other work order management systems. It is the perfect solution if a current third-party work management system is not in place. WTS is ideal for any industry, including Hospitality, Manufacturing, Education, and Healthcare. Seamlessly send and monitor work tickets to ensure all issues are being dealt with in a timely manner. Teldio’s Work Ticketing System (WTS) is also compatible with Smart Tickets ensuring that work ticket management runs smoothly from beginning to end. 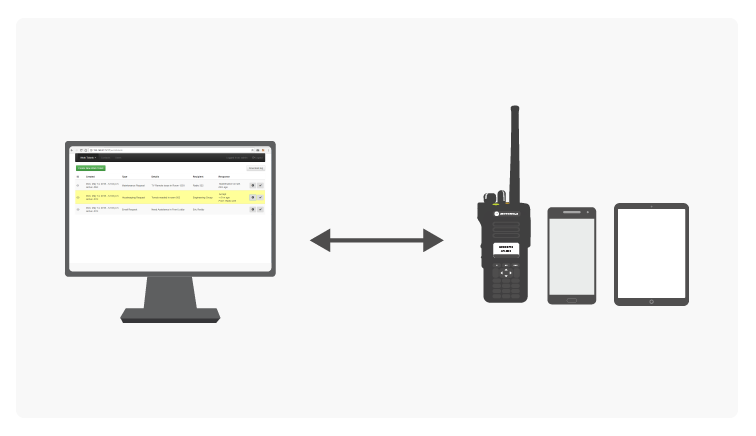 As a team member accepts and closes a work ticket, the remaining group members’ radios automatically update the work ticket’s status. Smart Tickets gives you both, ensuring that work ticket management runs smoothly from beginning to end. With WTS key personnel are quickly notified of faults, requests and any tasks to be completed, ensuring all issues are dealt with in a timely manner. A machine issue arises within a production facility. The machine operator quickly notifies their supervisor of the issue, who sends out a ticket to all mechanics. A mechanic accepts the ticket and proceeds to resolve the issue in a timely manner. Administrators, dispatchers, and supervisors can track work ticket activity in real-time. WTS shows the ticket status and response information immediately. A supervisor at a healthcare facility needs to know the status of tickets at all times. From there they can ensure all patients are receiving their treatment at the appropriate times depending on their level of severity. Work tickets are sent out as needed with WTS. As users receive work tickets and accept, supervisors are notified as tasks are completed. A guest needs new towels in their room. 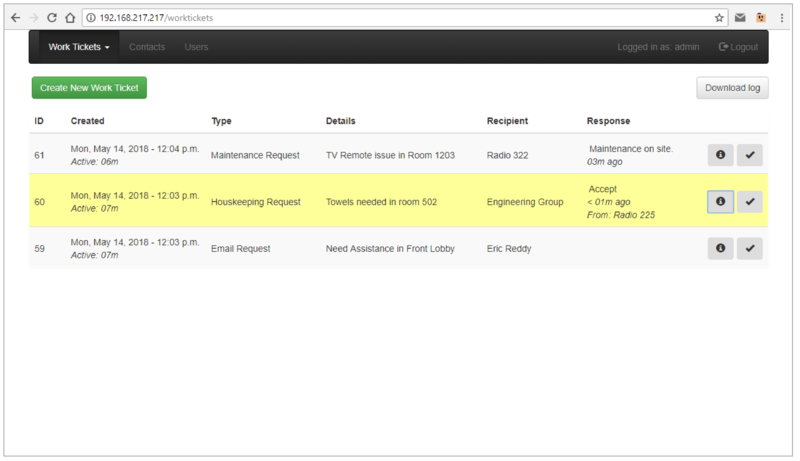 The Front Desk operator sends a request to all Housekeeping employees as a Smart Ticket. When one person accepts the ticket, the other users are alerted that the task is handled. WTS needs an IP network connection and/or radio network to be configured. Control stations (XPR 4000 or 5000 series) must be used for connecting to a Radio network. The base WTS package can support up to 2 control stations. Work tickets can be dispatched out to radios as a text message, job ticket, Smart Ticket, or to smart devices as an email. Admins can set message formats (job ticket, Smart Ticket, text message or email) for specific ticket types. Detailed Ticket and User access logs are tracked and can be downloaded as a CSV. WTS is also compatible with any email-enabled device.